Here on www.wdnicolson.com we've got all the Game Results, Match Reports, Game Highlights, Game Stats, Injury News, Press Conferences and NRL Tweet Player of the Year Award Votes in the one place. 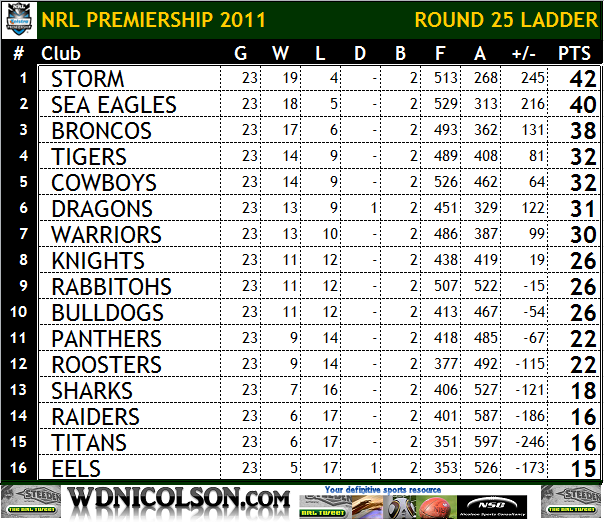 This Round Review also integrates our NRL Injured List - which if you haven't bookmarked by now - I suggest you do so. Player of the Year Votes are added as awarded by our panel - from Round 25 all votes go silent, all will be revealed on NOT The Footy Show's @NRLTweet Player of the Year Awards Monday 5th September at 7:30pm on ustream. Fantasy League Leaderboard is updated Tuesday. Pick your team from the positional tables and watch them score Tries for you throughout the Finals Series. There are triple points on offer for Grand Final Points and the winner walks away with a specially created NOT The Footy Show 'Old School Team Logo' T-Shirt. Cut-off is 7:30pm before the 1st Qualifying Final on September 9. The Leaderboard went silent as of Round 18 and the votes for Round 25 and 26 will also go silent ahead of the @NRLTweet Player of the Year Awards Show on Monday 5th September at 7:30pm. 7:45pm (Local) 26 August @ Brookvale Oval, Brookvale. NRLTweet Game Summary: Manly are impressive, Melbourne are out-gunned, but Glenn Stewart and Adam Blair losing the plot is the big story out of Manly's 18-4 win. All Votes for Round 25 and 26 are hidden - all will be revealed on the @NRLTweet Player of the Year Awards Show on Monday 5th September at 7:30pm. 7:45pm (Local) 26 August @ Parramatta Stadium, Parramatta. NRLTweet Game Summary: Parramatta keep finding ways to lose... tonight they blew a 12-0 lead with 12 mins left to get done 13-12 by Roosters in Golden Point. 5:35pm (Local) 27 August @ ANZ Stadium, Sydney. NRLTweet Game Summary: Canterbury down 22-6 to Newcastle at halftime, combine throwing the ball about in 2nd half with Ben Barba's brilliance to win 32-22. 7:35pm (Local) 27 August @ Canberra Stadium, Canberra. NRLTweet Game Summary: Canberra produce another unimaginative performance despite plenty of field position and Penrith spoil Tonguey's farewell 19-18. 7:35pm (Local) 27 August @ Dairy Farmers Stadium, Townsville. NRLTweet Game Summary: North Queensland maintain their Top 4 chances with a 28-20 win over Cronulla but are unimpressive, and lose Tariq Sims for season. 2:05pm (Local) 28 August @ WIN Stadium, Wollongong. NRLTweet Game Summary: St.George-Illawarra arrest their slide (hey they won) and move back into 5th with a come from behind 26-22 win over the Warriors at WIN. 3:05pm (Local) 28 August @ Suncorp Stadium, Brisbane. NRLTweet Game Summary: Darren Lockyer's touches of class help Brisbane beat South Sydney 22-10. Despite the loss Souths are still alive but Inglis is hurt. 7:05pm (Local) 29 August @ Campbelltown Stadium, Campbelltown. NRLTweet Game Summary: Benji Marshall's brilliant 1st half sets up a runaway 39-10 Tigers victory over the Titans at Campbelltown. Now in 4th. 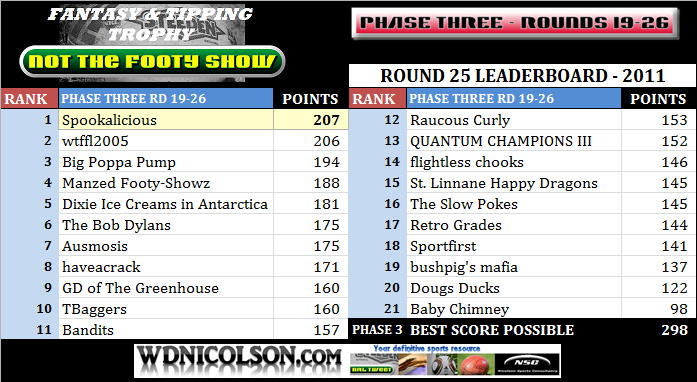 ]-[ There are just 2 weeks left in NOT The Footy Show's Tipping Competition and the outright winner walks away with an Official Steeden Match ball.